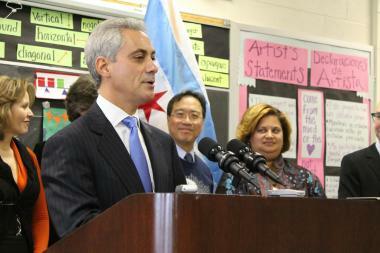 Mayor Rahm Emanuel unveils the city's new cultural plan today during a media event at a Pilsen school. World-renowned cellist Yo-Yo Ma and Michelle Boone, head of the city's Department of Cultural Affairs, join him in the background. CHICAGO — Mayor Rahm Emanuel today released Chicago's first new cultural plan in more than 25 years. Emanuel emphasized the plan's call for neighborhood involvement and arts education, saying its goal is to "put our culture right back where it belongs — in our neighborhoods and in our schools." Chicago Cultural Plan 2012 includes 10 specific initiatives, 36 recommendations and more than 200 ideas. The 10 initiatives include reinvigorating arts education, attracting and retaining local artists, optimizing city policies that "impact the arts and creative industries" and generally "integrating culture into daily life." Emanuel called it "a blueprint for the next 25 years for culture and art in the City of Chicago." 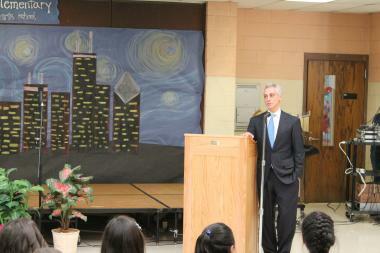 Mayor Rahm Emanuel addresses students at Manuel Perez Jr. Elementary School in Pilsen after releasing the Chicago Cultural Plan 2012. Emanuel, however, emphasized investment in children over actual government investment in the arts and culture. The plan was light on specifics concerning government support for the arts, such as anything pertaining to the music district Emanuel has suggested for the Uptown neighborhood, which is never mentioned in the actual text. "I think it's smoke," said Chicago artist Tony Fitzpatrick. "The only things of value in plans like this are the specifics and not the atmosphere. And I see a lot of atmosphere." The plan does suggest zoning changes and the use of tax-increment-financing-district funds to strengthen local arts and culture agencies. And Emanuel did say many of the plan's initial recommendations will take a little time and money to implement. Michelle Boone, commissioner of the Department of Cultural Affairs and Special Events, said a third of the plan's initiatives would cost less than $50,000 and could be achieved within two years. Boone called arts education "the No. 1 concern" of the plan, and Emanuel said, "There is a direct line between investing in your neighborhood cultural institutions ... and also the arts instruction that goes on in school." Pointing out that the recently negotiated longer school day will allow for two hours a week of arts instruction for all students, Emanuel added, "Arts education is essential for kids." Emanuel referred to the last citywide cultural plan, released by the Harold Washington administration in 1986, in suggesting the new plan could have a strong impact on development. He cited the creation of the downtown theater district as a product of the Washington plan. He also drew attention to the economic development in North Center surrounding the Old Town School of Folk Music as an example of how the arts can have an impact on the city's economic vitality. 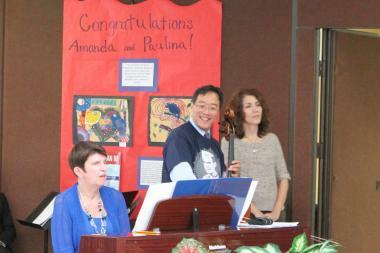 Yo-Yo Ma performs with teachers and students at Manuel Perez Jr. Elementary School as part of the release of Chicago Cultural Plan 2012. World-renowned cellist Yo-Yo Ma joined Emanuel in releasing and praising the plan. He also took part in a student performance for Emanuel after the media conference at Manuel Perez Jr. Elementary School in the Pilsen neighborhood.